This aloo methi is salty, spicy, savory and full of flavor! 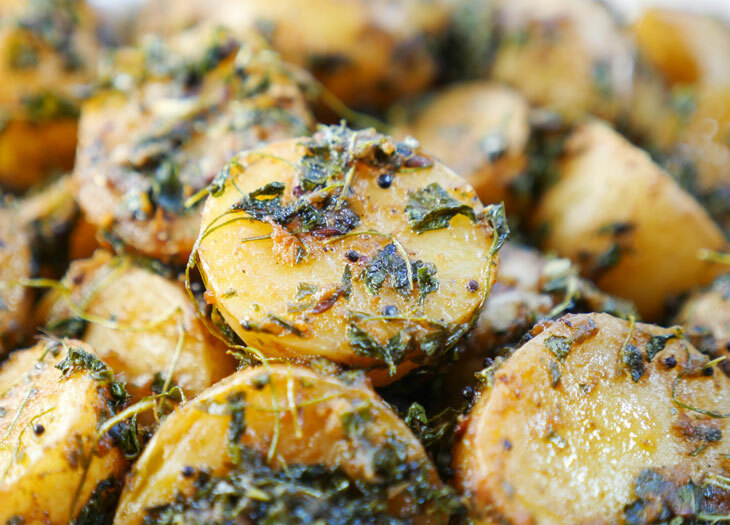 You will love this super simple recipe for aloo methi. You can have it on your plate in literally 10 minutes and most of that time is spent hands-off. This is why I love my instant pot, because I can make fabulous food in a fraction of the time it’d normally take. 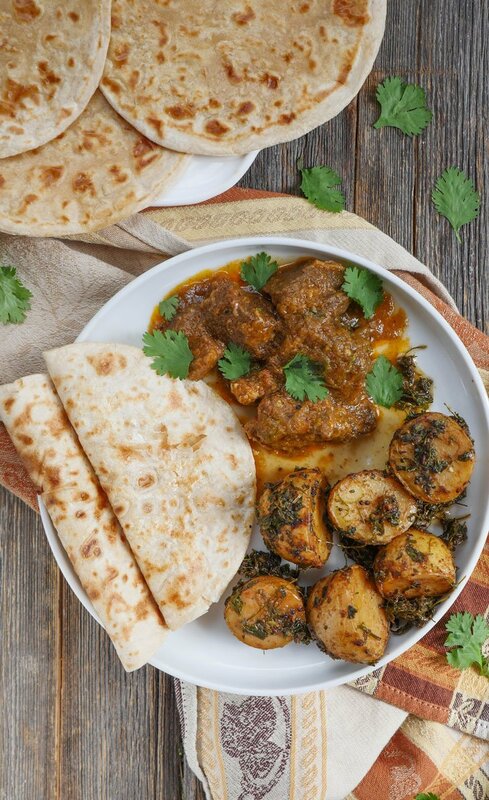 This recipe for Punjabi aloo methi is so tasty! It has a chatpata (tangy) flavor thanks to the dried mango powder (amchur) and the black salt (kala namak). 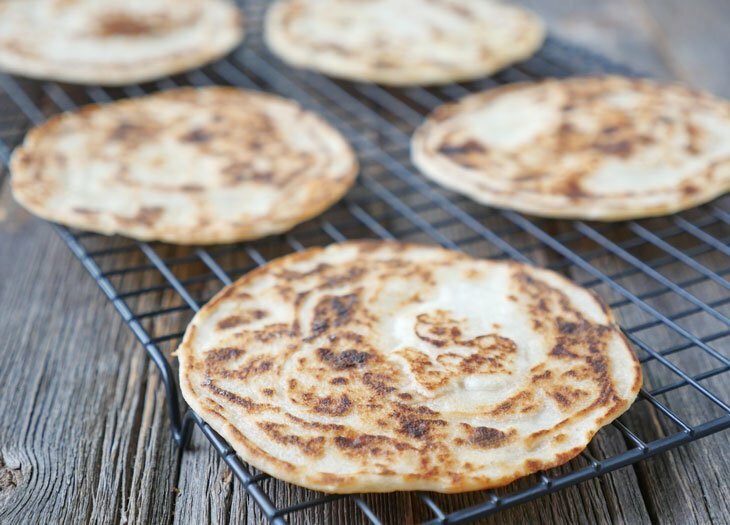 Serve this side dish with Indian flatbread like roti or naan and you will be in for such a treat! 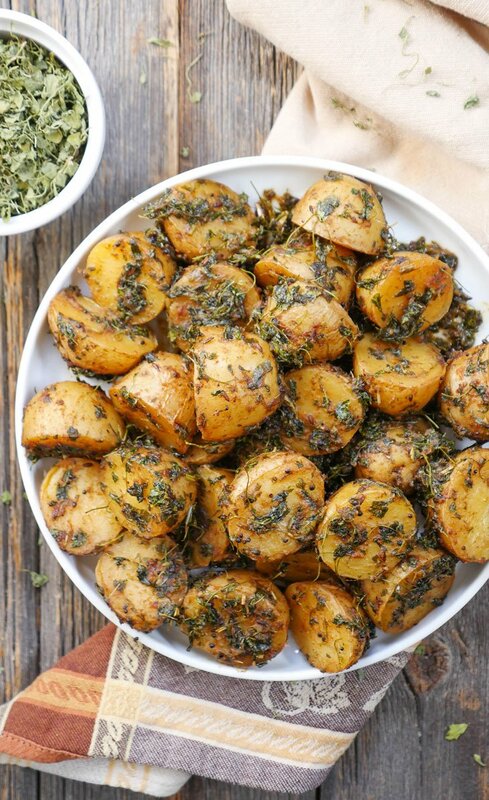 Aloo methi is a dry vegetable dish featuring potatoes and fenugreek leaves. My recipe calls for dried fenugreek leaves, also known as kasoori methi, which is easily found at your local Indian grocery store or online. In fact, you may already have this ingredient if you’ve tried my popular butter chicken recipe. Just a pinch of this stuff transforms butter chicken into a restaurant-quality dish. It’s magical. Well, this recipe for aloo methi features kasoori methi as a main ingredient so there is quite a bit of it in the recipe! 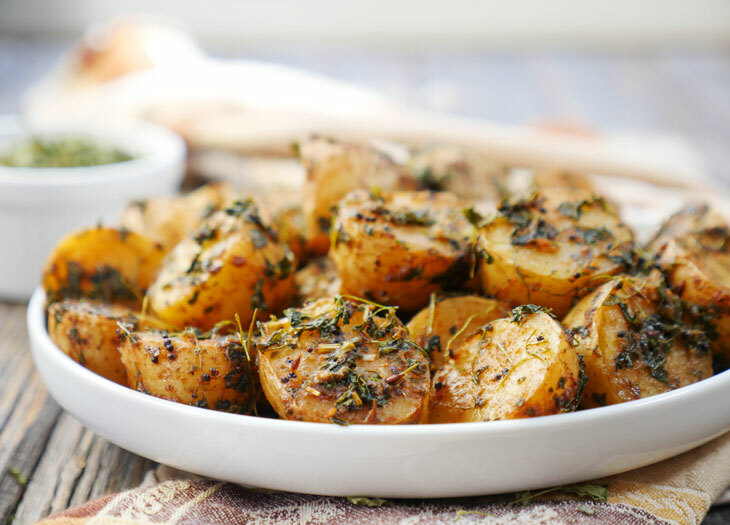 If you love the flavor of kasoori methi then you will love this dish for aloo methi! My mom recently threw an Easter party for my son while my husband and I were out of town for a wedding. At the party, she served lemon rice and chicken bhuna and she also served this aloo methi. We weren’t at the party but we got to enjoy her aloo methi when we came back home after a long day of travel and oh my goodness, it was love at first bite! I told her I HAD to have the recipe to share on my blog with you. It was the tastiest aloo methi I’ve ever had! Unfortunately, those of us with Indian parents know that they never measure ingredients…. like, ever. I was determined to recreate my mama’s fabulous aloo methi, so with a list of the ingredients in hand, I set out to experiment. And I did it! This is as good as my mama’s aloo methi and I consider that a huge success. What I love about aloo methi is that it’s so easy to make – especially when you have my onion masala prepared. Having masala ready to go makes this dish an almost dump and go recipe. I say almost because you still have to brown the cumin seeds and mustard seeds in hot oil for the best flavor. If you’re not familiar with my Indian Onion Masala Series then you have to check it out! As part of the series, I share recipes that call for exact amounts of onion masala. Click on the graphic below to find out how to make onion masala, how to store it and to find other recipes that call for it. If you’ve never used black salt before, you’re in for a surprise. When you add it to the instant pot, you might be like whoa – this stuff smells strong. It is pungent – cooking the black salt will remove some of that sulfurous odor. My husband doesn’t like black salt on it’s own but he loves this aloo methi. I personally love black salt (I used to sprinkle it into my coca-cola as a kid lol… anyone else do that?). Anyway, my point is – the sulfurous smell will definitely mellow out once the dish is done. I love making egg curry in my Instant Pot because I can cook both the sauce and the eggs at the same time! 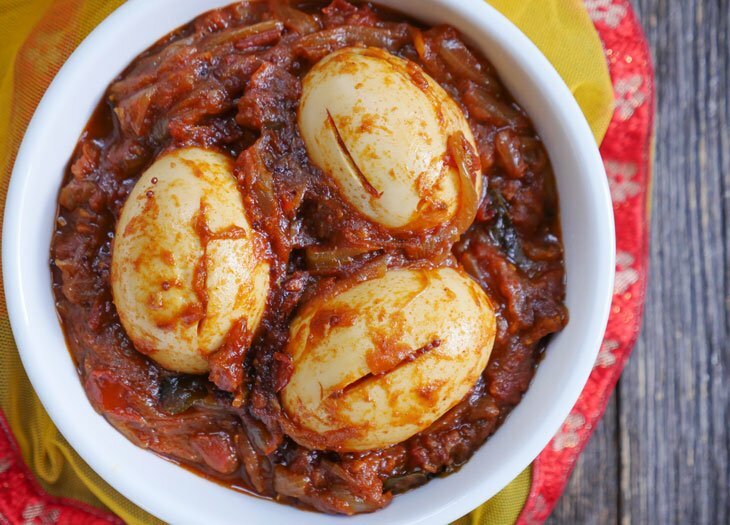 What the heck is a “dry egg curry?” It just means the eggs in this dish are coated in a thick sauce made with ripe tomatoes and sweet caramelized onions. If you like egg curry, you are going to love this recipe for egg roast! 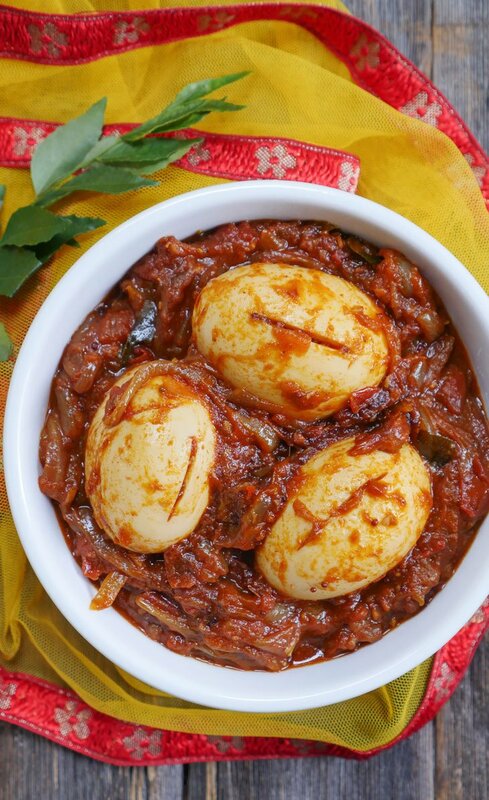 This masala egg roast is also known as nadan mutta roast, a dish from the coastal south Indian state of Kerala. Unlike most of my Keralite recipes which call for coconut, this dish just so happens to be coconut-free. Though if you prefer a saucier curry, you can always stir in some coconut milk at the end if you’d like. In Keralite homes, this dish is typically served during breakfast or brunch but in my half Keralite house, we’ll usually make it for lunch or dinner. It’s a great vegetarian main dish! You can serve this with any Indian flatbread though in Keralite homes, they’ll make something called appam or puttu (my MIL makes these – I have yet to perfect them). If you are gluten-free, you can serve this with my paleo naan or if you eat regular roti, then you can check out this review of the rotimatic that I recently wrote. When making this dish – don’t skip the curry leaves. Yes, the dish will still be good without them BUT they are important if achieving the right flavor for this dish. You can easily find curry leaves at your local Indian grocery store or on amazon. 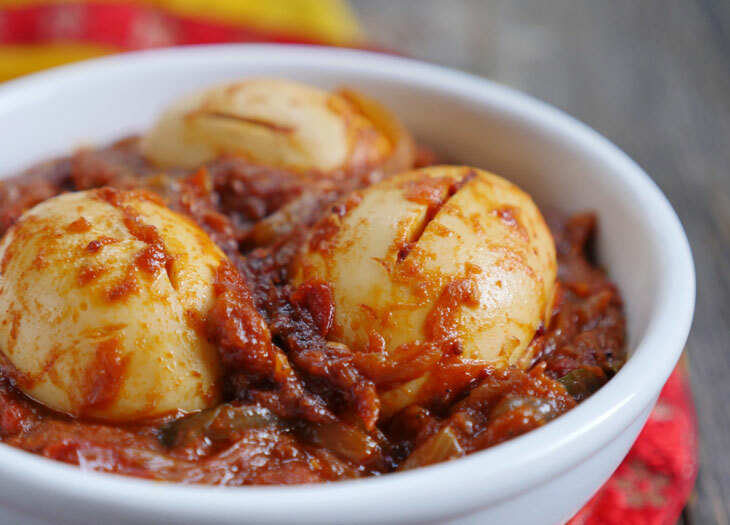 I hope you love this Kerala egg roast! This is a recipe from my cookbook, Indian Food Under Pressure. I also have a delicious egg korma recipe in the book that you should try as well! 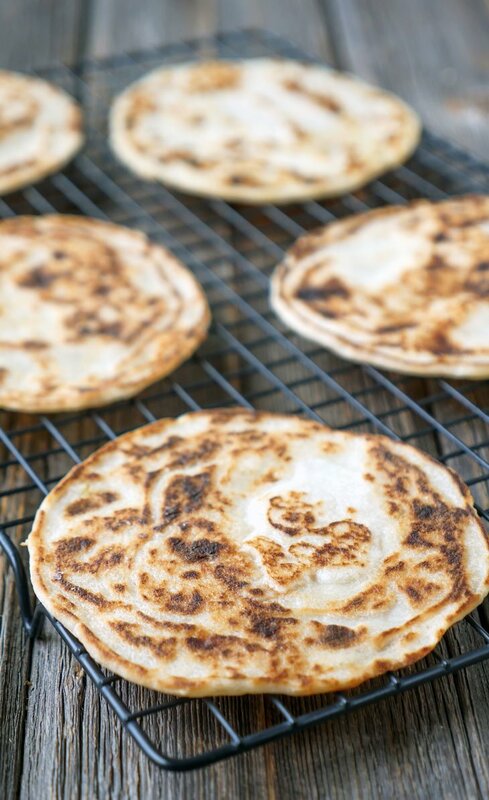 I’m sure you’ve all heard or hopefully tried my 3 ingredient naan recipe by now. It went viral years ago and is still one of my most popular recipes. 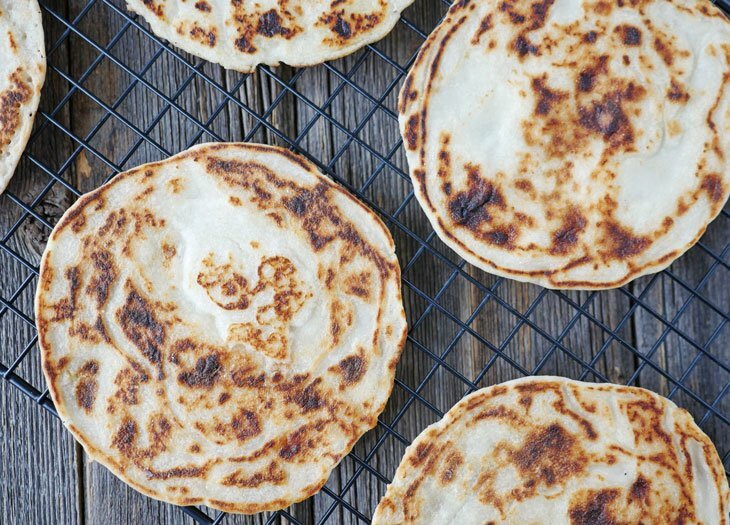 Well ladies and gents, there is a new naanin town and this naan is made with coconut flour! Aloo gobi, a classic Indian dish made of spiced potatoes and cauliflower, is one of the most popular Indian vegetarian recipes. This is a side dish that you’ll find in any Indian restaurant and it’s also served in many Indian homes. Anyone who loves Indian food has heard of aloo gobi, a simple yet flavorful vegetarian/vegan dish made with spiced potatoes and cauliflower. 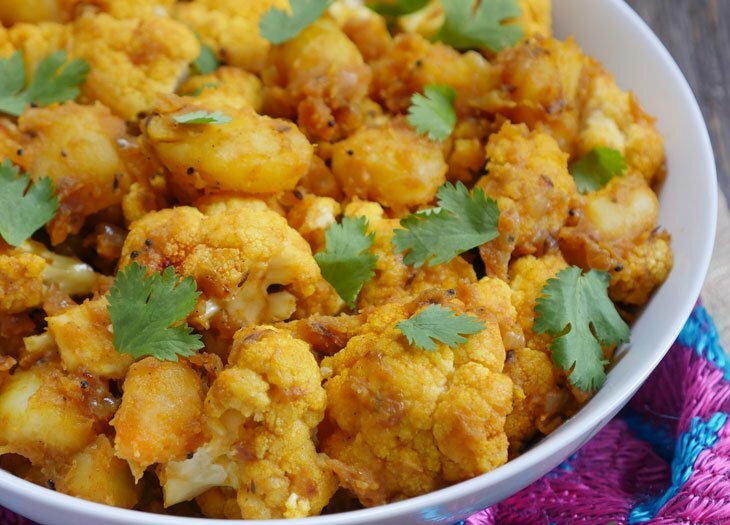 Aloo gobi literally translates to “potato cauliflower” – these two humble ingredients are known for their ability to soak up flavor and so when combined with spices, the dish transforms into something pretty darn special. 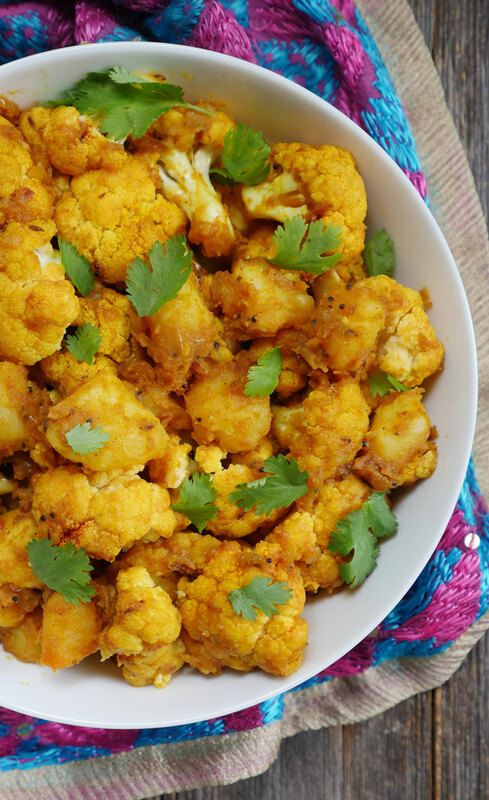 I am sharing my recipe for aloo gobi using two cooking methods: the instant pot and the stovetop. I personally prefer using my instant pot these days because it makes cooking so much easier but feel free to make it either way. I will share a few notes for those of you planning to use your pressure cooker to make this. 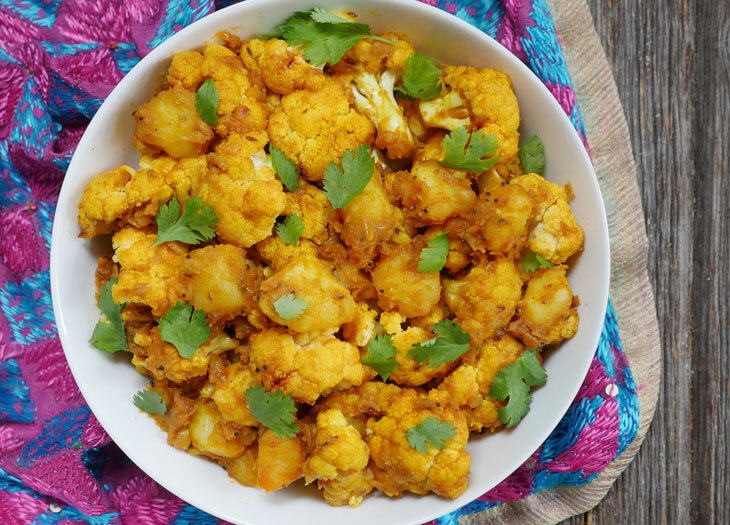 Aloo gobi is a dry dish and yes, it is absolutely possible to make a dry dish in an instant pot. In fact, I have several “dry recipes” in my cookbook, Indian Food Under Pressure. As for the cauliflower – I prefer mine to be tender with a bit of bite to it so I cut my cauli into large florets. If you prefer soft cauliflower, then you can cut it into smaller florets. Feel free to adapt the recipe to your preference. What can I serve aloo gobi with? If you’re following a paleo diet and like Indian food, then you are in for a treat because I have come up with a recipe for grain-free and dairy-free dahi vada! 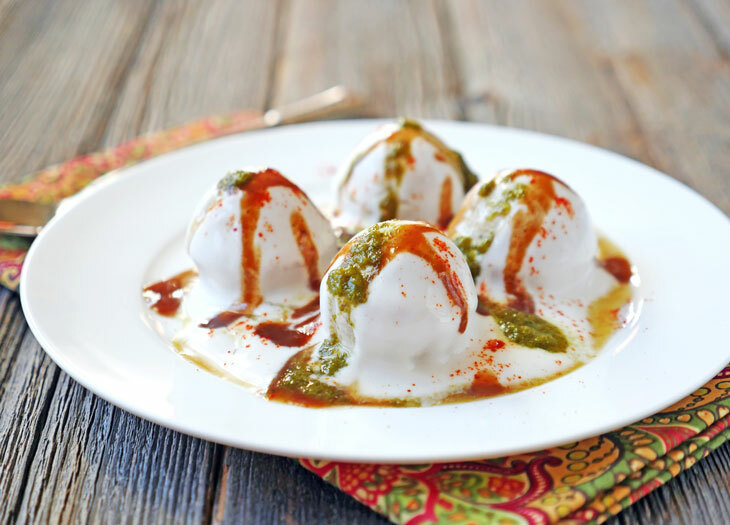 These little paleo dough balls are smothered with creamy yogurt and topped with sweet and spicy chutneys, making for a super tasty Indian appetizer. If you’ve never had dahi vada before – it is traditionally a fried lentil dumpling – but my recipe is lentil-free. I wanted to create a lentil free recipe for those who can’t tolerate legumes and/or for those following a paleo diet. Another big difference between the traditional version and mine is that I don’t fry the fritters. Rather than deep frying the dumplings, my recipe calls for baking them in an oven using a donut pan OR you can also use a donut maker if you have one. This is an Indian street food and it goes by many different names – it’s also known as dahi baray, dahi bhalla and well, a lot of other names. I actually came up with this paleo version several years ago when I wrote this Paleo Indian eCookbook – it has 100+ Paleo Indian recipes and this recipe for dahi vada one of them. Instead of lentils, my recipe calls for a combination of paleo friendly flours: almond flour, arrowroot flour and coconut flour. The coconut flour does a great job of soaking up the coconut yogurt. I have this funny feeling that there isn’t a single person out there searching for this recipe. I mean, dahi vada is a naturally gluten free dish so is there anyone out there who really needs a grain-free and dairy-free version? Maybe this is a recipe that you didn’t know you needed in your life. Maybe you’re already following a paleo diet and you happen to like Indian food and will want to try this? Whatever your sitch – you’ll definitely love this if you make it. 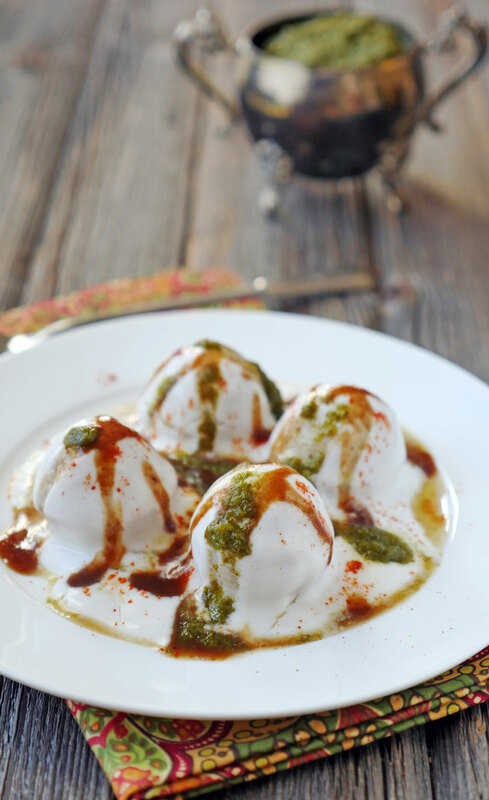 You’ll also want to have some chutneys handy to top these dahi vadas – a few of my favorites: chaat sauce, tamarind chutney and green chutney. You can make these sauces and freeze them – that’s what I do – then just break off a frozen piece and thaw as needed. I hope you love this appetizer! It’s perfect on a hot day – the cool and creamy dahi and chutneys will absolutely cool you down. Enjoy! 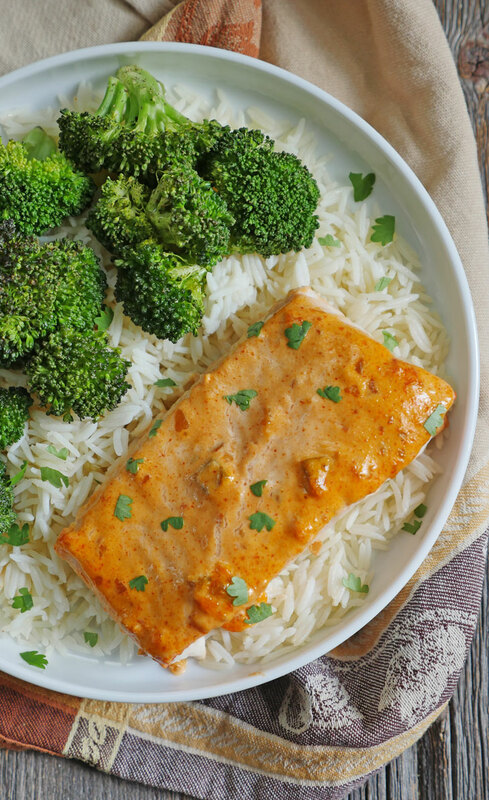 This quick and easy baked salmon recipe is flavorful, tasty and takes very little effort to make. 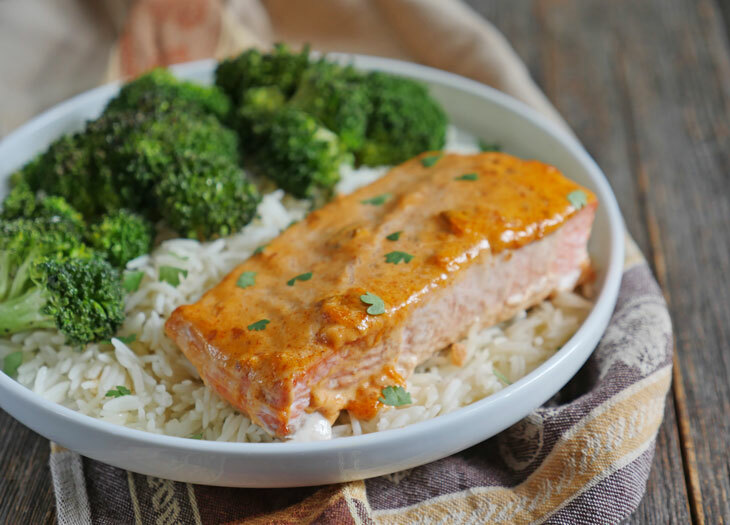 You just top the salmon with a simple mix of salsa and mayo and when it comes out of the oven you’ll have a delicious, creamy and moist flaky fish. It’s the perfect last minute dish to serve on a busy weeknight. This salsa mayo salmon is super simple you guys. It’s delicious, quick and so darn easy to make. It takes no time at all to prep but it’s somehow still big on flavor. Because there are only three ingredients you’re going to want to make sure all three are really high quality. For the fish, I suggest buying fresh wild caught salmon. As for the mayo and salsa, you can make your own but I prefer the convenience of store-bought. As a toddler mama, I just don’t have time/energy to make homemade mayo and fresh salsa all the time. I mean, having to make those two things would also kind of defeat the point of throwing this simple dinner together. That said, if you have the time to make those two things from scratch then more power to ya. If you’re looking for good store bought options, I like the organic spicy salsa (whole foods brand but any will work) and sir kensington’s mayo. I can’t take credit for this recipe. I have had it written down for years – it’s a recipe that was passed down… from a friendly fishmonger at a Publix grocery store in Florida. He shared it with my husband’s aunt who shared it with my husband’s mom (my MIL) and she shared it with me. I’m not sure if this is the exact original recipe but the gist of it has to be the same – you mix salsa and mayo together and put it on top of salmon and then bake. Easy. 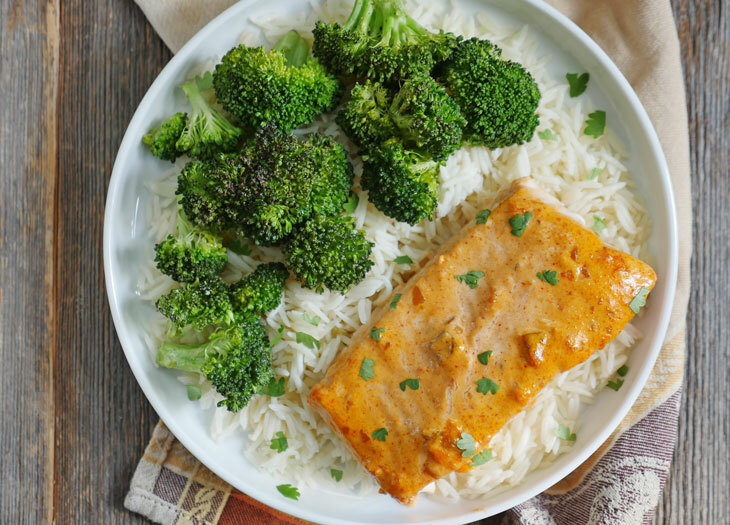 When you make this salmon, you can add some broccoli onto the pan right along with it – I do that all the time and it makes for a nice sheet pan dinner. I also like to serve it with basmati rice. And because I’m Indian, I add cilantro to everything so if you’ve got some add it but if not, you really don’t need it. 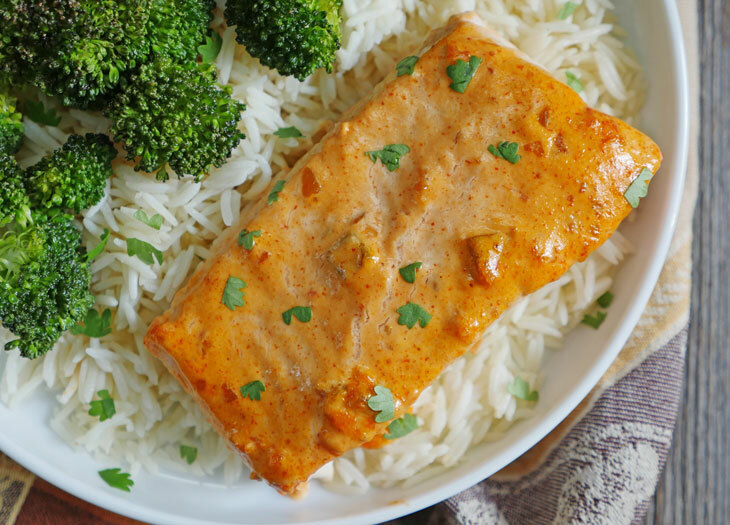 Let me know what you think if you try this salsa mayo salmon! 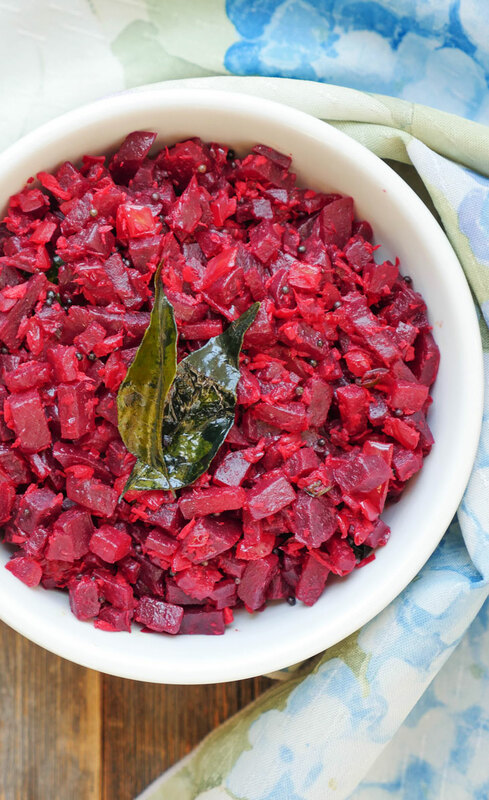 his simple South Indian side dish is my favorite way to eat beets! Beet thoran is a flavorful stir-fry cooked in curry leaf spiced coconut oil with onion, fresh or frozen grated coconut and a few spices. Making this side dish in an instant pot makes cooking this thoran a breeze! It’s no secret that I love beets – after all, the name of my blog is My Heart Beets. 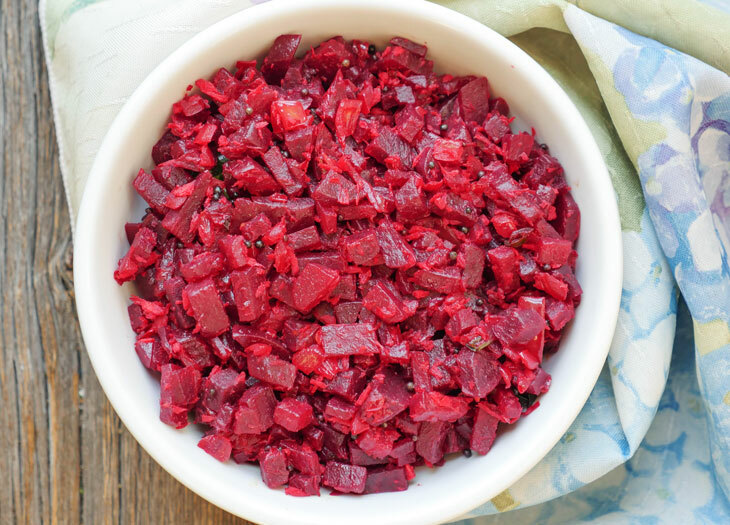 This simple beet recipe is one of my all-time favorite side dishes to make when preparing a Keralite meal. 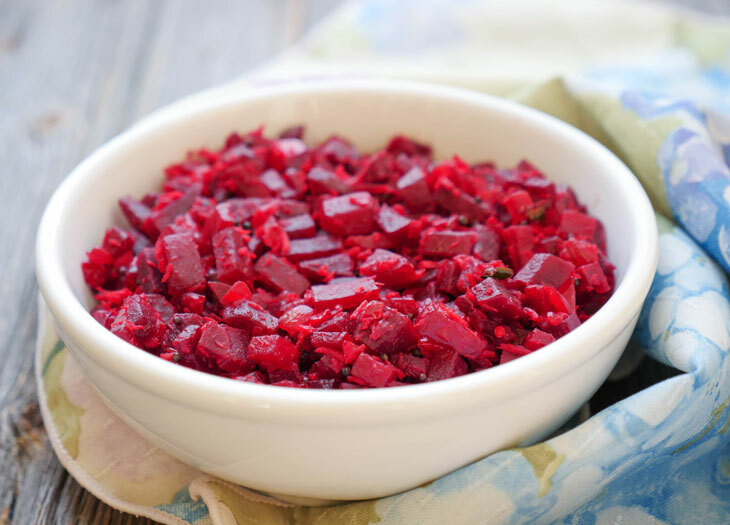 In the past, I used to chop or grate raw beets (which isn’t very easy to do) and then cook them (see my old recipe… definitely not as easy as this one). With my instant pot recipe, I first steam the beets in the pressure cooker which makes it easy to remove the peels and then chop up the soft beets. Then, I stir-fry them. It’s so much easier to make which means we eat this thoran far more often. If you’ve never heard of the word “thoran,” it basically just means “stir fry” and is a traditional Keralite way of cooking. You can make anything into a thoran! You just need to grate or chop vegetables, mix them up with a few other ingredients and stir-fry it all together. When I say you can make anything into a thoran, I’m not kidding. Here are just a few thoran recipes on my blog: zucchini, butternut squash, cabbage, sardines (yep, even sardines…). I also have a green bean thoran in my instant pot cookbook – you should check out my book if you haven’t already! I only started making thoran after marrying my husband, Roby, whose family is from Kerala. It’s now my favorite way to cook vegetables because while flavorful, it’s not overpowering. I feel like typically Indian vegetable dishes are heavily seasoned, especially north Indian recipes. Don’t get me wrong – both are equally good in completely different ways. It’s just nice to enjoy a lightly seasoned veggie dish sometimes, where the vegetable really shines. It’s like, in this dish, the beet is the star and the other ingredients merely supporting actors. I’m currently imaging a large beet dancing in the middle of a stage with lights shining down on it… a jar of coconut oildances in the distance. Sometimes I tell myself that I write these random things in my blog posts to see if anyone is actually paying attention… but the truth is that this is actually what goes on in my mind. I’ve already written about half of a beet themed musical in my head in the amount of time I’ve spent writing this post. 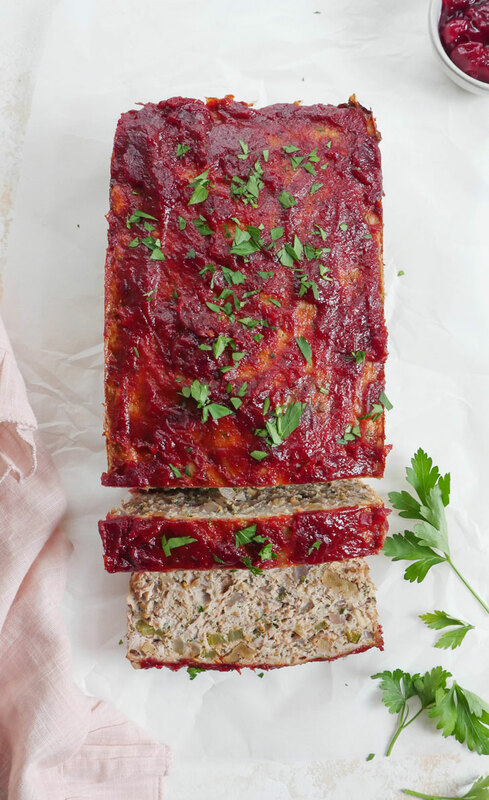 Out of all the thoran dishes I’ve tried/made, I have to say beetroot thoran is my all time favorite (my hubby’s favorite is green bean thoran – which is again, in my cookbook!). I hope you love this recipe and find it super easy to make. One thing to keep in mind – depending on the size of the beets you use, you may need to adjust the cook time. I find that 15 minutes works well for me for medium to large beets but if you’re using smaller beets, you can probably reduce that time to 10-12 minutes. 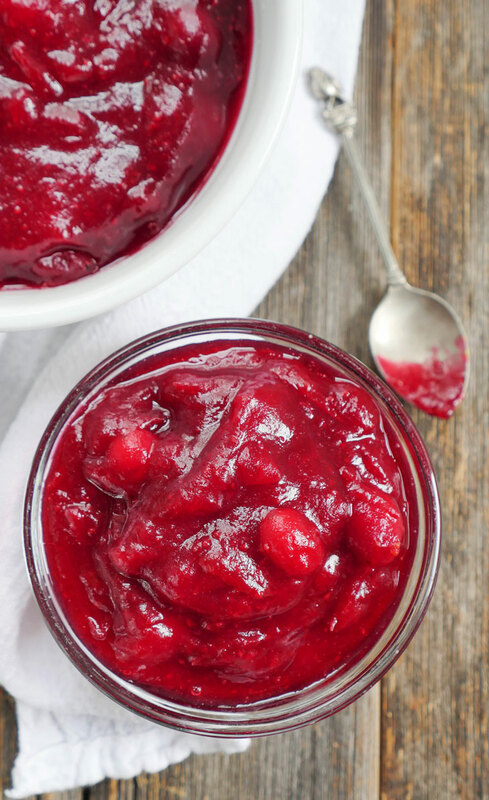 What’s the best thing about this delicious homemade sweet and tart cranberry sauce? The fact that it’s effortlessly easy and absolutely perfect! You’re going to want to have this bright, tangy and sweet sauce on your dinner table this holiday season. 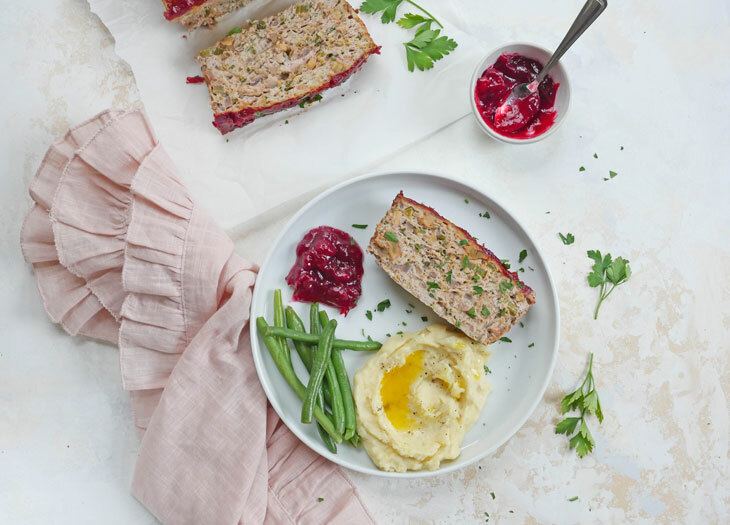 This instant pot cranberry sauce is perfect for savory meats (hello turkey and ham) or use it in/on sweet treats (cranberry cheesecake using my 2-ingredient cheesecake recipe? yes please!). I know a lot of people use orange juice in their cranberry sauce but I’ve always been pro-apple juice when it comes to cranberry sauce. 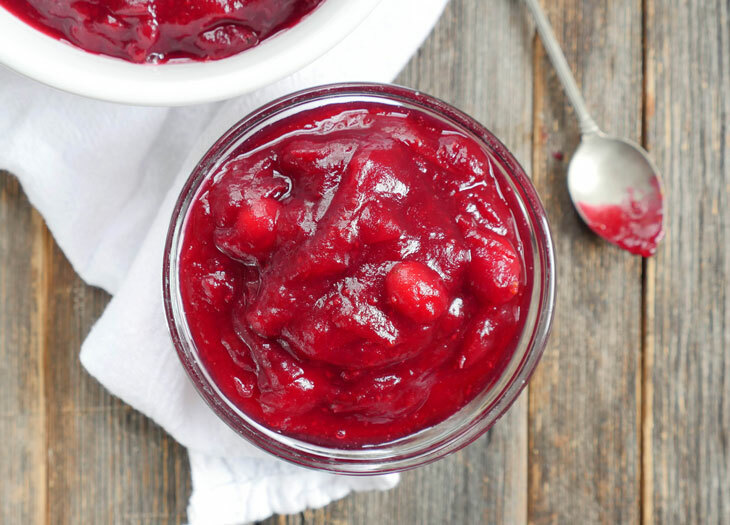 Cranberries are tart and apple juice adds a fruity sweetness to the jam plus it allows me to get away with using a bit less sugar. That said you can use orange juice or water if you’d like. You guys. Promise me you won’t buy cranberry sauce this year. Plus, homemade is always best. Unless you’re like my younger brother and prefer the “ridges” that come from a can of jellied cranberry sauce… in which case, I don’t think we can be friends (unless we’re related) so maybe stop reading my blog lol. And yes, Rishi if you’re reading this I will have a can of sauce just for you and I will also be annoyed about it come Turkey day. Back to my homemade cranberry sauce. 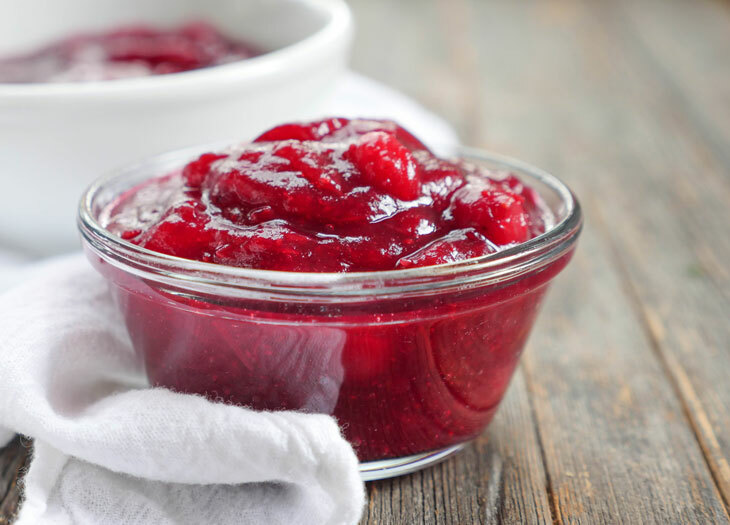 No need to stand by the stove waiting for cranberries to pop – instead, dump them into your pressure cooker and sit down on the couch with your feet up. Put on a Christmas movie (thank you Netflix) and chill. You can make the sauce right now which means one less thing to make during the actual holiday. This is one thing you can make pretty well in advance. 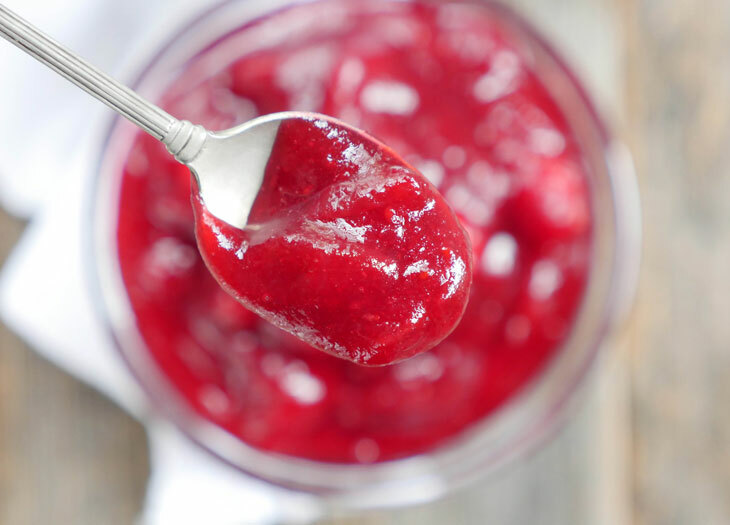 I feel like cranberry sauce always tastes better after a few days anyway – the tartness mellows out a bit and it gets nice and jammy after chilling in the fridge. Homemade cranberry sauce will last in the fridge for like 10 days and in the freezer for a few months. 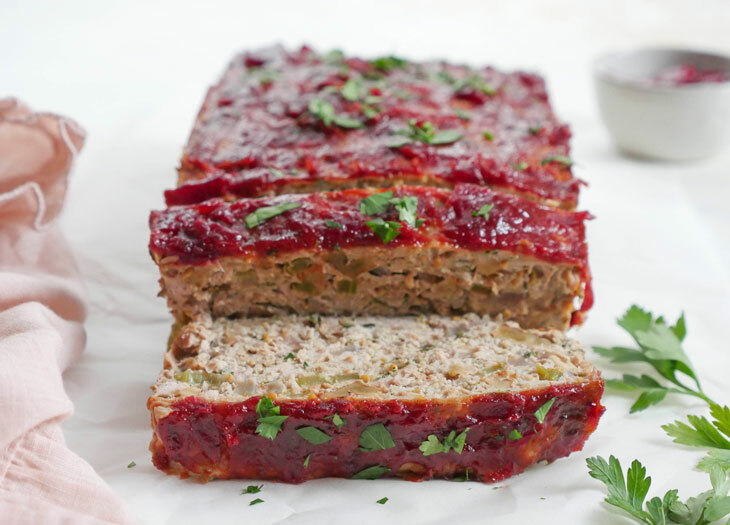 So make this for Thanksgiving and save leftovers (if there are any) for Christmas! Or just make a double batch and freeze half. Serve this sauce with turkey or my Thanksgiving meatballs or beef rib roast or my instant pot ham. Happy Holidays! 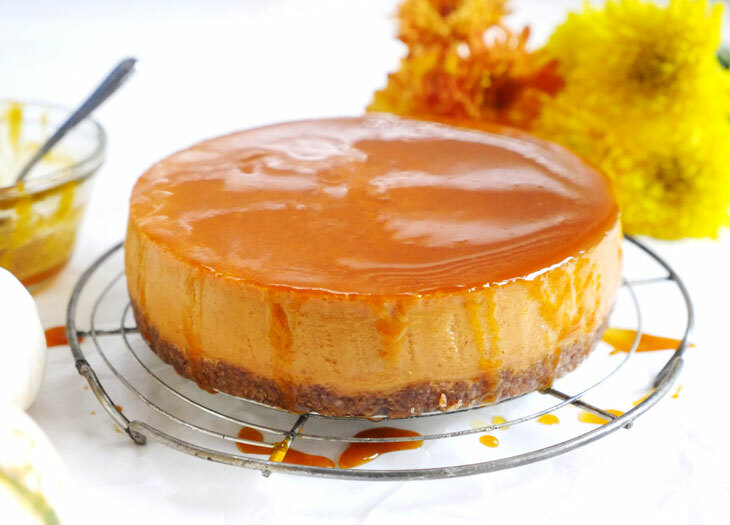 This delicious and creamy pumpkin cheesecake is so easy to make! You only need a few ingredients to make this cheesecake and you can do it all in an instant pot! Move over pumpkin pie, there’s a new dessert in town. Meet my friend: pumpkin cheesecake. 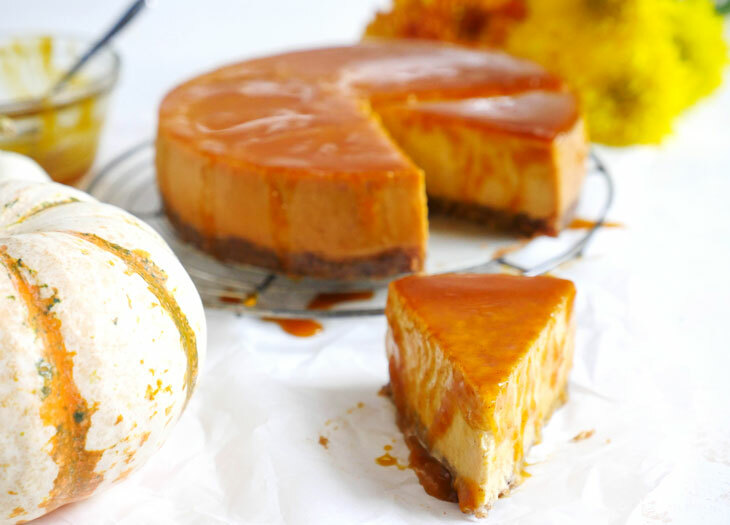 This isn’t your average pumpkin cheesecake either… this is a super tasty and creamy pumpkin spiced cheesecake with an oatmeal cookie crust! And it’s topped with a sweet pumpkin glaze. It’s going to blow all of your other desserts out of the water. I’m not sure why I’m getting competitive over dessert – because really, you can have it all over the holidays. Have your pumpkin pie, your pecan pie and apple pie. 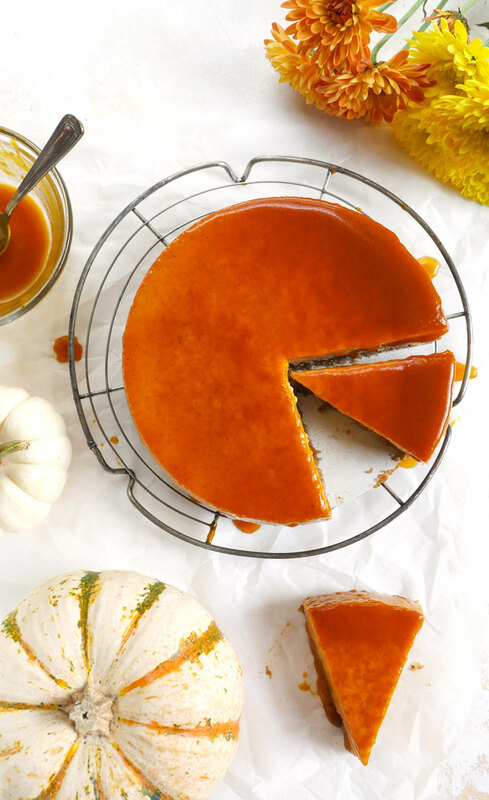 Just don’t forget this pumpkin cheesecake because it’s the best. Sorry, I can’t help myself! It’s really that good. This isn’t your average cheesecake. The two main ingredients that make the base of this cheesecake: yogurt and condensed milk. I know, I know – how can it be cheesecake without cheese?! Well these two ingredients somehow form the most magical dessert and it tastes JUST like cheesecake. This recipe just so happens to be easily adaptable. Here is my original recipe and from this, I’ve also shared recipes for mango cheesecake, lemon cheesecake and now this pumpkin cheesecake! I can’t wait for you to try my pumpkin cheesecake! You’re going to love everything about it! While you can certainly make this without a crust – I highly suggest trying it with my oatmeal cookie crust – the two go together SO well. 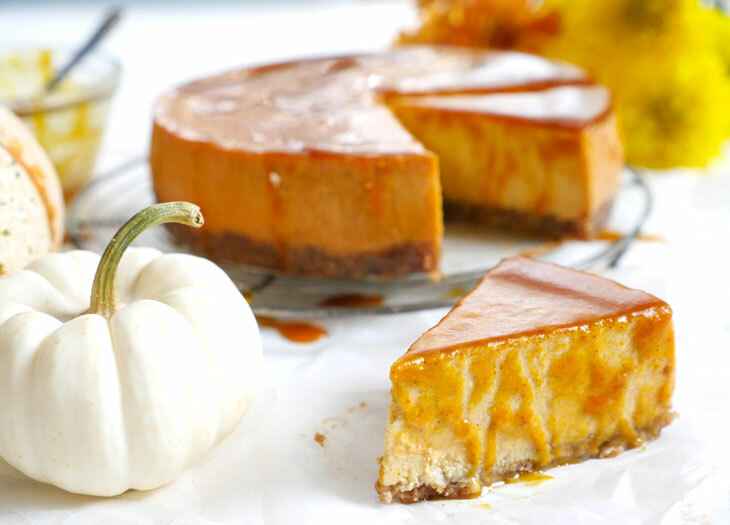 Sweet and creamy pumpkin cheesecake with a little bit of sweet crunch in the crust! You’ll love it! Press the crust onto the bottom of a greased 6-inch (or 7 inch) cheesecake pan with a removable bottom. Add the condensed milk, yogurt, pumpkin puree and spices to a bowl and mix well. Pour the mixture on top of the pie crust then cover the pan with foil. Naturally release pressure for 20 minutes, then release any remaining pressure (do not leave the cheesecake sitting in the pot). The cheesecake should be set – it shouldn’t wiggle. Combine the pumpkin puree, maple syrup and spice together in a bowl and mix well. Pour this on top of the cake right before serving. This will add great flavor and color to the cake and make it look pretty!